Principals - Agnoli Barber & Brundage, Inc.
Dominick J. Amico, Jr., P.E. Mr. Amico has been with Agnoli, Barber & Brundage since 1983, focusing his expertise on subdivision and site design, water management systems, and utility and pipeline design, including sanitary and hydraulic systems analysis. He acts as principal-in-charge and project manager for numerous projects, directing all aspects of the engineering process and assuming responsibility for ultimate quality control. As a Southwest Florida resident for over 40 years, Mr. Amico is thoroughly familiar with local conditions and issues. He maintains an active civic presence in the community, reflecting his commitment to this area and its long-term needs. 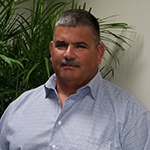 Mr. Carr joined Agnoli, Barber & Brundage in 1997 as a project manager after working with another local firm where he earned his Florida Professional Engineer license. He has served as project manager for many projects of various size and scope for both public and private developments. Mr. Carr is a native and lifetime resident of Naples and Collier County, which brings an exceptional familiarity with local development history and knowledge of regulations. As project manager and designer, Mr. Carr has led his team on the planning, design, coordination, permitting, construction and bidding assistance and all aspects of project management. Developments include commercial shopping centers, mixed use, residential subdivisions, multi-family, high-rise towers, golf course development and clubhouses, public schools and government buildings, and roadway, utility and drainage projects. Edward F. Tryka, III, P.E. Mr. Tryka has been with Agnoli, Barber & Brundage since 2000 starting as a senior design engineer and now acting as a project manager with a primary focus on transportation, roadway design and drainage. Duties include geometric design, drainage design, preparation of maintenance of traffic plans as well as directing, training, and supervising Engineers-in-Training and CAD technicians and maintaining client contact on project design issues. Prior to joining Agnoli, Barber & Brundage, Mr. Tryka spent three years in Atlanta, Georgia, designing roads for the Georgia Department of Transportation and local county governments. While at ABB, Mr. Tryka has managed such complex projects as Livingston Road Six-Laning project, Summerlin Road Six-Lane Improvements, White Boulevard bridge replacement, City of Bonita Springs Downtown Redevelopment, and many other transportation-related projects. Mr. Agnoli began his land surveying career as a survey crew rodman in 1983 when Agnoli, Barber & Brundage was first formed. He was promoted to instrument man and then to survey crew party chief. Mr. Agnoli became licensed by the State of Florida as a Registered Land Surveyor in 1994. As a principal and project manager, Mr. Agnoli takes direct responsibility for some of the firm’s most complex surveying and mapping projects which include boundary surveys of sectionalized lands, subdivisions, and metes and bounds parcels; land platting; boundary and topographic surveys for engineering design; quantity surveys and hydrographic surveys; record surveys for construction projects, mortgage updates, condominium exhibits and environmental jurisdiction lines; construction layout for underground utilities, roadways, and buildings; photogrammetric control surveys; right-of-way mapping, right-of-way control surveys and right-of-way design surveys; piling geometry and layout for high-rise building foundations. Mr. Hackney has been working in the surveying field since 1986, when he first joined Agnoli, Barber & Brundage. He began his duties as a survey crew rodman and was later promoted to instrument man and later survey crew party chief. Mr. Hackney left ABB for the University of Florida in 1991 to pursue a Bachelor’s Degree in Surveying and Mapping, returning in 1993 after graduation. As a project surveyor, Mr. Hackney is responsible for boundary surveys of sectionalized lands, subdivisions, and metes and bounds parcels; topographic surveys for engineering design, quantity surveys; condominium surveys and preparation of condominium documents; hydrographic surveys; roadway control surveys, roadway design surveys and right-of-way mapping; subdivision planning and construction layout of all phases of subdivision construction, including home sites, utilities, roadways and buildings; record surveys/as-built surveys; field locations of environmental jurisdictional lines; horizontal and vertical control for aerial photography. Mr. Hackney’s technical background includes proficiency in Leica GPS Systems, AutoCAD versions R-12 through 2007, electronic data collection systems and processors, Carlson Surveying Program, Leica Geo-Office GPS software, Trimble GPS Systems. Mr. Barber joined Agnoli, Barber & Brundage, Inc. in 2004. As a native resident of Bonita Springs and current resident of Estero, his familiarity with the area lends to his experience with local projects and regulations. Through his years of experience with ABB, he has grown with the company into his current role as a certified planner and project manager. He currently oversees projects varying in size and scope in both the public and private sectors. His responsibilities as a planner and project manager include construction and bidding assistance, design, planning, coordination, and permitting. His experience in the civil engineering field includes: construction management, water quality analysis, site development design, conceptual site planning, water quality and stormwater projects, project development (commercial and residential), client relations, and lake bank restoration. As a certified planner, Mr. Barber is also experienced in conducting public outreach and presenting project phasing status details to engaged community members. Ms. Anderson has been with Agnoli, Barber & Brundage since 2011 and serves as the Comptroller and Human Resources Director. Ms. Anderson is instrumental in the day-to-day operation of the firm, specifically dealing with contract administration, billing, budgeting, and general office management. She holds a bachelor’s degree in finance.